Find out the status of bus and rail services as well as the trunk road network. Use our Journey Planner so see what options are available for your trip. We've picked out some top attractions in the region and also grouped them by location. Arbroath Abbey is famously associated with the Declaration of Arbroath of 1320, which asserted Scotland's independence from England. Arbroath Signal Tower Museum is located in an elegant complex of regency buildings which, until 1955, housed the shore station and family living quarters for the light keepers of the Bell Rock Lighthouse. 700 years after the legendary battle, the new Battle of Bannockburn experience puts you right at the heart of the action. Using cutting edge 3D technology you can learn about this crucial event in Scottish history and experience medieval combat like never before. You'll even be able to take command of the knights and soldiers who fought in 1314, pitting your wits against fellow visitors on the virtual battlefield. The experience is as authentic as it is breathtaking. Discover Blair Castle, the ancient seat of the Dukes and Earls of Atholl and home to Europe's last remaining private army, the Atholl Highlanders. More than 30 rooms are on display, full of Scottish cultural history, architectural design, period furnishings, family portraits, landscape paintings and a colourful military past. Scotland’s safari park is located between Stirling and Doune, and is the only place in the country where you can see elephants and giraffes. Voted the 2010 Scottish Thistle Awards Winner for the "Perfect Kid's Day Out", Blair Drummond lets you come face to face with spectacular exotic animals. Camperdown Country Park is Dundee's largest public park, covering over 400 acres and with no fewer than 190 species of tree. Fancy a fun family out with lots of amazing animals? Then you are in the right place ... Camperdown Wildlife Centre is open all year round and we have lots of happy animals that are looking forward to your visit. So come and explore Camperdown Wildlife Centre with us! There are many who believe that the Championship Course at Carnoustie is the finest test of championship golf to be found anywhere the game is played. Visit an exhibition, see a film, take a print course and enjoy great food at Dundee's international centre for contemporary arts. Located in the centre of the city, Dundee Contemporary Arts is a vibrant building with five floors hosting unique exhibitions, world cinema, a café-bar, and a print studio. With over 60 hands-on exhibits depicting the senses, visitors aged from 4 to 104 can experience the magic of science at Dundee Science Centre. The Glenturret Distillery is a hidden gem, set on the banks of the river Turret in the beautiful town of Crieff and only an hour from Glasgow and Edinburgh. Novices and whisky enthusiasts alike will enjoy the distillery tours, with a chance to see the Guinness World Record for the largest bottle of whisky! Last tour 90 minutes before closing. The family home of the Earls of Strathmore and Kinghorne, Glamis Castle is the legendary setting for Shakespeare's Macbeth, the childhood home of HM Queen Elizabeth, The Queen Mother and the birthplace of Princess Margaret. 31 Mar 2015 - 31 Oct 2015: Group bookings are available by appointment. For those who are addicted to the game of golf, Gleneagles offers the chance to play on the world's finest courses. As well as the challenge of the King's, the secluded charms of the Queen's, or the nine hole Wee Course, there is now the exceptional PGA Centenary Course designed by Jack Nicklaus. The Hermitage is a conifer and deciduous wooded gorge with natural features including the River Braan and Ossian’s Hall. This handsome Georgian house boasts stunning interiors and outside, visitors can explore the garden and woodland walk. House of Dun is a Georgian building overlooking the Montrose Basin, designed and built by William Adam in 1730 for David Erskine, Lord Dun. Visit the birthplace of author and playwright JM Barrie, the creator of the much loved Peter Pan. In this two-storied house JM Barrie (1860 - 1937), the creator of Peter Pan, was born. The upper floors are furnished as they may have been when Barrie lived there. The adjacent house, No 11, contains an exhibition The Genius of JM Barrie which presents Barrie’s literary and theatrical works. The outside wash-house is said to have been his first theatre. For thousands in the 19th century, Dundee was a city of long working hours, poor pay and ill health. For the privileged few it was a city of opportunity and wealth. At Scotland's Jute Museum @ Verdant Works the rattle and the roar of the original restored machinery, the Juteopolis film show and computer displays transport you back over 100 years to an era when jute was king and Dundee was its realm. The McManus: Dundee’s Art Gallery & Museum, an award-winning Victorian, Gothic building, is home to Dundee's main collection spanning 400 million years. Eight beautiful open gallery spaces house facinating exhibitions of art, history and the environment, giving a fascinating insight into Dundee. Covering 750 hectares, Montrose Basin is home to over 50,000 migratory birds including pink-footed geese, Arctic terns, knots and sedge warblers. The four- star visitor center offers a great day out for all the family in Angus. Perth Concert Hall is a new building that is home to an exciting programme of music, new media arts, community events and conferences. Scotland’s ‘Theatre in the Hills’ offers an exciting year round programme of theatre, touring companies and music. The theatre restaurant offers tailored menus providing tasty, unpretentious and contemporary food for lunch and pre-theatre dinners. Experience life in the Antarctic with Captain Scott and his crew on the RRS Discovery at Discovery Point. Uncover the tale of one of the most heroic voyages of exploration ever undertaken. Scone Palace was the crowning place of Scottish kings where Macbeth, Robert the Bruce and Charles II were once crowned. Stirling Castle is one of Scotland's most historically important sites and was once a favoured residence of the Stewart kings and queens who held grand celebrations at the castle. Welcome to Stirling Smith Art Gallery and Museum, we are a free attraction with 2 exhibition galleries, museum cafe and our own garden perfect for picnics and playing. Also home to Oswald the Museum Cat! 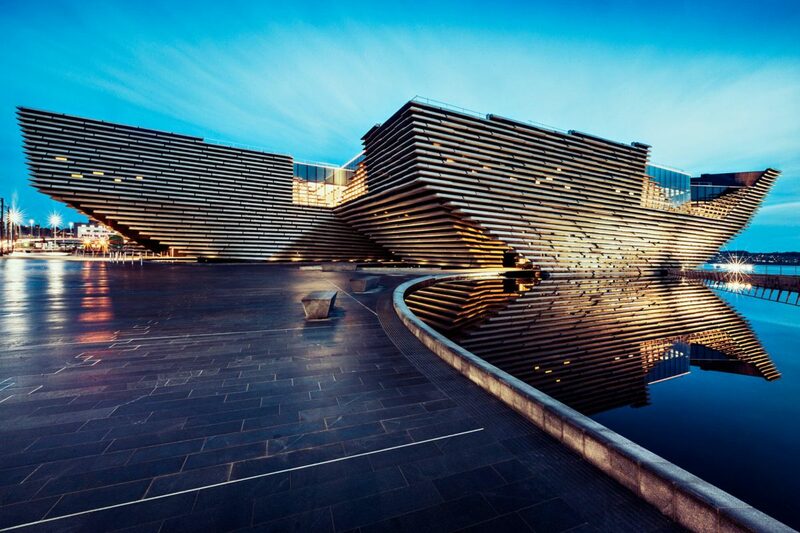 An international centre of design, V&A Dundee presents the brilliance of Scottish creativity and the best of design from around the world. One of the most distinctive landmarks on the Stirling skyline - The National Wallace Monument commemorates the Scottish patriot and martyr who triumphed over King Edward's army at The Battle of Stirling Bridge.